How are your API (air photo interpretation) skills? API is becoming an archaic art form nowadays. Before it dies out, here’s a visual quiz to see how well you can interpret vegetation patterns from the air. First the easy questions. How many animals can you see in the photo above? Can you find the dog and the dolphin? What else can you see? Now the ecology questions: Why do the trees grow in rings? What kind of trees are they? What happened, about 70 years ago, to form the curious shapes? If you’re puzzled, the clues lie in the brown areas surrounding the tree rings. You can click on the photo to enlarge it and see more details. The next photo shows the same area about 70 years earlier. The shapes are much the same, but the vegetation is very different. Here’s three more questions to test your API skills: what are the big white blobs? Why aren’t any trees growing on or around them? What caused this pattern to change to the one above? The photo below provides the missing link. Did your explanations ‘hold water’? The photos show bands of river red gum (Eucalyptus camaldulensis) forest on the Murray River at Lake Mulwala. The black and white photo was taken in 1941, just before the lake was dammed. The photo of the flooded lake was taken in 2005, and the top ‘animal shape’ photo was taken in 2009, when the lake was emptied to control the invasive aquatic weed, Egeria (=Elodea) densa (Leafy Elodia). The dry bed of Lake Mulwala in July 2009. The dam wall and Yarrawonga and Mulwala townships are at the far left. The ‘animal shapes’ are at the far right. Source: Google Earth. It’s easier to grasp the ecological context of the ‘animal shapes’ and the ‘big white blobs’ from a landscape view. 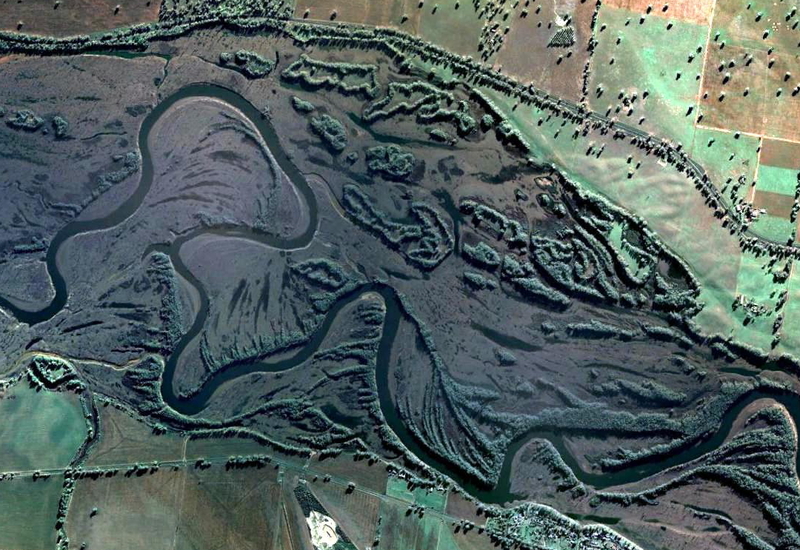 The sinuous river in the black and water photo below is the Murray River. The Murray River at Lake Mulwala in 1941. In the photo below, the channel of the river can just be seen beneath the flooded lake. The flooded Lake Mulwala in 2005. Is that a dog or a horse? Source: Google Earth. The dry bed of Lake Mulwala in 2009. 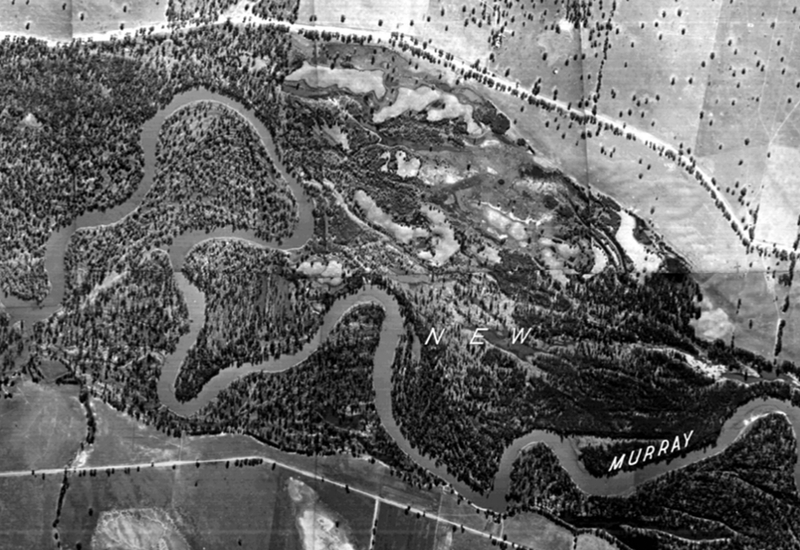 The original course of the Murray River can still be seen. Source: Google Earth. I assume you worked it all out. 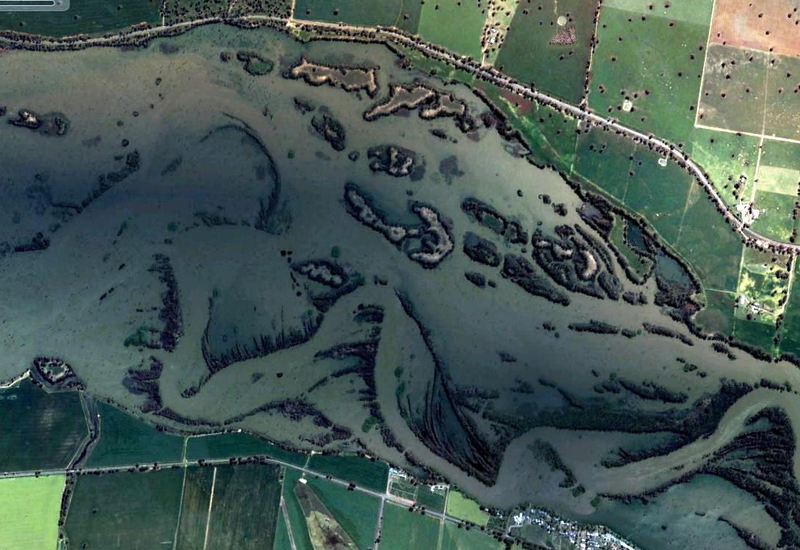 The animal shapes are islands, fringed by bands of river red gums, which grow at the water’s edge. 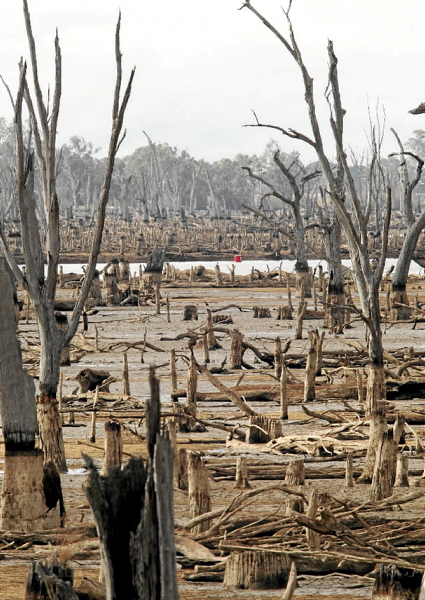 Before the lake was built, the floodplain supported a large red gum forest. Nowadays the lake bed is covered with fallen trees and dead stags. Don’t ask me why, but lots of people love gazing at flooded, dead tree trunks so the lake shore is prime real estate. A forest of dead trees on the drying lake bed. Source: Border Mail. Two questions remain: what are the big white blobs on the 1941 photos, and why don’t trees grow across the entire islands rather than just around the edges? The white areas are sand hills, which formed in an earlier, drier epoch. The sandy rises are too dry to support red gums, which is why red gums grow around the edges of the islands but haven’t colonized the island tops, even in the flooded lake. Originally, the bare sand hills may have supported Murray Pine (Callitris gracilis ssp. murrayensis) or White Cypress-pine (Callitris glaucophylla). Callitris were widely chopped down in the 1800s for timber and to clear the sandy soils for cropping. Nowadays, most sand hills are extremely degraded and covered with exotic annual grasses and herbs such as Paterson’s Curse (Echium plantagineum). Consequently, Sandhill Pine Woodland is now an endangered community in NSW. To compensate in a very minor way for the many hectares of flood-killed forest, red gums have expanded on the floodplains upstream of the lake. Perhaps this was triggered by changes to flooding patterns after the lake was built. The following photos show a stretch immediately upstream of Lake Mulwala, where river red gums have colonized areas that were once cleared pastures. River Red Gums on the Murray River upstream of (what is now) Lake Mulwala, in 1941. River Red Gums on the Murray River upstream of Lake Mulwala in 2009. Source: Google Earth. So there you have it. Sandhills + Water = Animal Crackers. Just add water. Growback 2: a shrinking wetland? Ian, why are the outlines not filled in? The red gums were not there in 1941. In the 70 years of the rise in water, wouldn’t other trees have grown in what used to be the dry sandy areas in the middle? Callitris maybe or grey gum? Maybe there is a simple answer that this non ecologist is ignorant about…. Hello DC, great question. I suspect that the main reason why other tree species haven’t colonized the center of the sand hills is that they can’t disperse onto them. The original trees were cleared long before the dam was built, and the water now acts as a barrier that prevents distant trees getting to the islands. Eucalyptus and Callitris seeds don’t disperse far from the parent trees, and most seeds fall within 1-2 tree heights. Thus, if the parent trees are 20 m tall, then most seeds will fall within 40 m of the parent trees. Any nearby grey box and cypress-pine trees are too far away from the islands now. I imagine that the center of the islands may get colonized by trees or shrubs in the future, but the best colonists are likely to be species with fleshy fruits that get dispersed by birds. Unfortunately the most common fleshy fruited species in the region are exotics. The introduced African Box-thorn (Lycium ferocissimum) has fleshy red berries, and is very common on dry sand hills in western NSW (see this link for more info on box-thorn). I’d imagine that it might be one of the more likely species to colonize the sand hills in the future. Another likely candidate might be the exotic Pepper-corn Tree (Schinus molle), which also has pink berries that are dispersed by birds.